TBILISI, DFWatch–The head of the Georgian Orthodox Church has asked for the power to pardon prisoners. 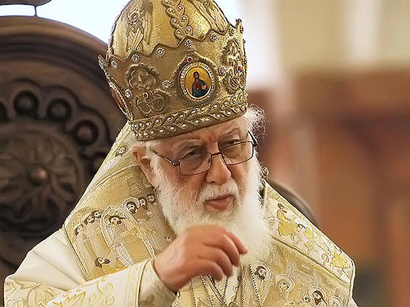 Catholicos Patriarch Ilia II said Saturday that he thinks a patriarch should be able to pardon prisoners and added that he has spoken with the prime minister about this. The patriarch and PM Irakli Garibashvili attended a performance by women inmates at Rustaveli Theatre. There are currently two ways prisoners can be pardoned in Georgia. The president has the power to pardon prisoners, and there are parole boards at the Prison Ministry that are also entitled to give recommendation to release prisoners. If the patriarch is also to be given powers to pardon prisoners, a constitutional amendment will be necessary. Eka Beselia, an MP from the ruling Georgian Dream coalition and head of the human rights committee, responded by saying that the patriarch is the most trusted person in Georgia and he has to have the power to pardon prisoners. “If there is a political consensus, I am sure many people will support granting this opportunity to the Georgian patriarch by legislation,” she said. Prison Minister Kakha Kakhishvili also supported the idea. “He is the abbot of the nation. I have never met a wiser person, and he surely has to have such a right,” he said. Opinion polls conducted by National Democratic Institute have consistently shown that the Georgian patriarch is the most trusted person in the country, with a level of trust always above 90 percent. The army, the police and the courts have scored below 80 % in the same polls. The Orthodox Church is not state religions in Georgia, but it does enjoy a special status under an agreement between the state and the Church called the Concordat. Later on Saturday, Irakli Garibashvili asked the president and the parliament to consider granting the patriarch powers to pardon prisoners. “[Ilia II’s] every advice is important and valuable for every person,” a statement published by the PM’s administration reads.